A hexafoil wood stand, the single plank top inset and slightly raised, supported by six legs, each composed of twin arched sections of wood, joined together by a jointed wood stretcher at the top and at the bottom. The wood is strongly grained, showing a wavy structure, and is finished with a dark brown patina. The tomobako is inscribed on the outside rokuryodai (stand with six­sided corners) and on the inside Showa juuichinen haru, Bunroku saku (made by Bunroku, spring of Showa 11 (1936)). 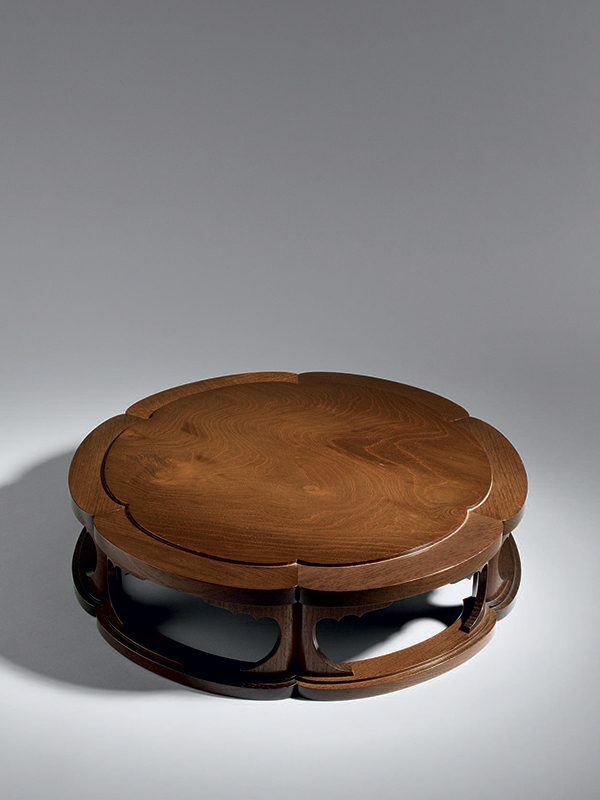 The wood used in this beautifully constructed stand is strongly grained, resembling chestnut. A stand like this was used as the base for a Buddhist statue, or a bell or gong. Sometimes such stands were also used as a base for formal flower­arrangements in tea ceremonies. The hexafoil shape is probably based on the doctrine of the Rokkon Shojo, the Purification of Six Senses (seeing, hearing, smelling, tasting, feeling, and thinking).